Provide comfort for the family of James Reilly with a meaningful gesture of sympathy. James D. Reilly Jr., age 86, of Monroe, CT went home peacefully to our Lord on January 21, 2019. Mr. Reilly was born in Bridgeport, son of the late James and Anna Reilly. He was predeceased by his loving wife Mary Lou, son Fran Reilly (Carrie), and son-in-law Rich Mitarotonda. 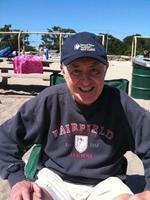 Jim graduated from Fairfield Prep and Fairfield University. Following his military service in the Navy in the Korean War he began a successful career in computer sales at Burroughs Corporation. Jim was a man of profound faith and integrity. He is survived by his loving, children Tim Reilly (Debbie) from Newtown, Maura Reilly from Norwalk, Meg Reilly Dunleavy (Kevin) from Fairfield, James Reilly lll (Karen) from Santa Clarita, CA, and Shannon Monaco (Mike) from Monroe. He is also survived by 16 grandchildren and 15 great-grandchildren. Friends may greet the family at the Cyril F. Mullins Funeral Home, 399 White Pains Rd. Trumbull on Thursday, January 24 from 3:00-7:00. Funeral Mass will be on Friday, January 25 at St. Stephen’s Church, 6948 Main St, Trumbull at 10:00. PLEASE do not send flowers! To send flowers in memory of James D Reilly Jr., please visit our Heartfelt Sympathies Store. Provide comfort for the family of James D Reilly Jr. by sending flowers. I offer my deepest condolences to Mr. Reilly's entire family. He deeply touched my life in a very short period of time and I am so grateful that I got to know him even for a brief time. I will miss his smile, and I will miss singing with him. Rest in eternal peace Mr. Reilly. Our deepest condolences to the family. James will be dearly missed and never forgotten. May our Heavenly Father hear the prayers of your heart and comfort you. 2 Corinthians 1:2-4. Our loving thoughts and prayers.